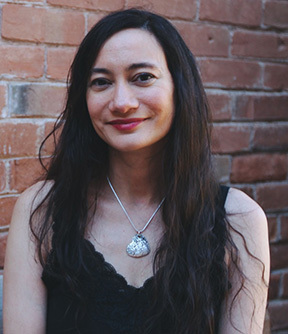 Elizabeth Maria Naranjo is the author of The Fourth Wall. Her short fiction and creative nonfiction have appeared in Brevity Magazine, Superstition Review, Hunger Mountain, Hospital Drive, The Portland Review, YA Review Net (YARN), Literary Mama, Motherwell, and several other places. She is currently revising her third novel (a ghost story for adults) and seeking an agent for a middle grade book and a collection of short stories. Elizabeth lives in Tempe, Arizona, with her husband and two children. She blogs about books and writing at elizabethmarianaranjo.com. Before you read her interview, be sure to read her story Gratitude and then come on back! WOW: First of all, congratulations on your win! To start out, what was the inspiration behind your story "Gratitude"? Elizabeth: I wrote “Gratitude” in a fall workshop where you’re provided a weekly prompt and asked to produce a story or essay of no more than 500 words. The prompt that week was “Hot Mess.” I imagined two girls, one going through a pretty terrible time with her parents divorcing, and the other who appeared to have no definable problems, yet still felt like a hot mess. I was intrigued by the second girl, because she’s having to navigate the emotional turmoil of adolescence, which is bad enough. Yet she can’t talk to her best friend about it because she feels her pain is unearned in comparison. I thought that must feel so lonely. WOW: Oh I love how you interpreted that writing prompt! How did this story change from its first draft to the final draft? Elizabeth: The story itself changed very little. Here’s a fun fact though—in the first draft (and most subsequent drafts), the cherries floating in melted ice cream at the end were compared to bobbers, because the main character had described her parents fishing and I thought that was a neat tie-in. My critique partner clearly felt otherwise; she highlighted the bobber phrase and wrote “awkward.” I pulled it immediately, because she’s always right, and now I cringe when I think I’d ever written it that way, hahaha. WOW: LOL, I've had those moments myself in writing! I can't help but notice you have quite a lot of success under your literary belt! What advice do you have for new writers? Elizabeth: Thank you! My advice to new writers is have fun and enjoy the process. It really shouldn’t be painful, at least not until the editing stage. Drafting should instead be magical—you’re creating people and maybe even worlds that didn’t exist before; you can make up anything you want. That’s incredibly freeing. If you wrote as a child, try and recapture how that felt. You weren’t worried about markets and genres and platforms. You were just excited to write a story. WOW: Oh I love your advice and needed to hear that myself actually! So, you do so many different types of writing, from short fiction to nonfiction to novels for both adults and middle grade readers. How do you write for so many different types of readers? Elizabeth: Stories are about the same things—fears, insecurities, loss, grief, love. We experience all of these as adults, but we also did as small children and as teenagers. If you can tap into those past selves, remembering what mattered to you, what haunted you, what brought you pure simple joy, you can write for a younger audience. Same with other points of view, only you’re imagining instead of remembering. All that’s really required is empathy. WOW: Fantastic insight! So, can you tell us a bit about the novel you are working on now? Elizabeth: I’d love to! It’s called The House on Linden Way, and it’s about a single mother who revisits her childhood home and literally becomes lost in her memories. Her daughter disappears inside the house and the mother is desperately trying to search for her while at the same time struggling to resist the lure of her past, which keeps pulling her back in. It’s essentially a ghost story. I never get tired of writing those. Nicole--Thanks for doing this interview, and for giving us the link to Elizabeth's story. Elizabeth--I loved your story. I kept wondering how you would end it, and when the final line came, it was perfect.